Info on Pink, Bender Jamboree, UNLVino, Las Vegas Highland Games, Beats &amp; Brunch, Bull &amp; Oyster Roast, Kenny Wayne Shepherd Band and more. 1. The LINQ Promenade is hosting its first weekend-long free art festival this weekend. Guests can color a baby grand piano, create their own rhythm on a one-of-a-kind LED drum kit, and draw on sidewalks. There will also be a walking cocktail tour, graffiti artists, art classes for kids, silent disco, live entertainment and more. 2. Actor and comedian Craig Ferguson is bringing his "Hobo Fabulous Tour" to Green Valley Ranch Resort on April 12. Ferguson won two Daytime Emmy Awards as host of "Celebrity name Game" and hosted "The Late Late Show with Craig Ferguson" for almost 10 years. 3. The singer Pink is bringing her Beautiful Trauma World Tour to T-Mobile Arena on April 12. Special guest Julia Michaels. Pink has sold over 90 million records worldwide and has won 3 GRAMMY awards. 4. The Bender Jamboree is happening through April 14 at The Plaza hotel-casino. Progressive acoustic and Americana music. Bands include Greensky Bluegrass, Railroad Earth, Leftover Salmon, Billy Strings, The Lil Smokies and many more. 5. The legendary John Fogerty is bringing his My 50-Year Trip tour to Wynn Las Vegas April 12-13 and April 17, 19 and 20. The tour celebrates the 50th anniversary of Woodstock. 6. UNLVino is Las Vegas' longest running wine and food festival. Bubble-licious is kicking off the festival on April 11 at Keep Memory Alive Center. Sake Fever is happening April 12 at Red Rock hotel-casino and the Grand Tasting is April 13 at The Mirage Events Center. 7. The Las Vegas Highland Games is taking place April 13 through 15 at Floyd Lamb Park at Tule Springs. There will be athletic competitions, bagpipe and dance competitions, traditional food, clan tents, vendors and more. Bring a non-perishable food item for SafeNest and receive $1 off. 8. Head to Brooklyn Bowl for Beats & Brunch on April 13. Enjoy yoga, bottomless mimosas, music, bowling and more. 9. 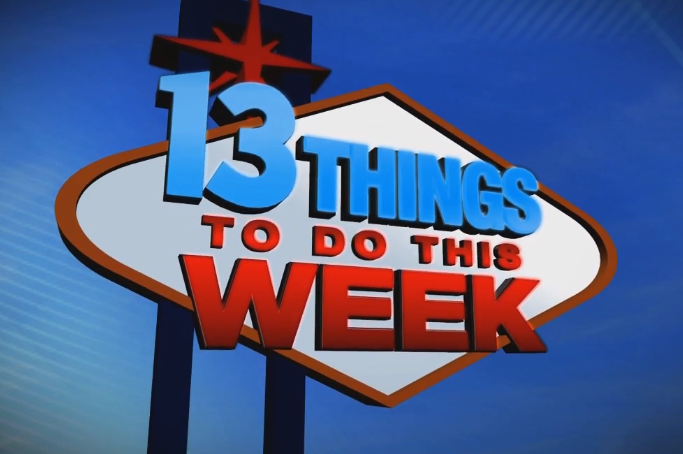 The LV Auto Swap Meet and Car Show is happening April 13 at Sam Boyd Stadium. Open to all makes and models. Bring your own food and beverage (no alcohol). 10. April's Shop Hop is happening April 13 at Palace Station. Enjoy free samples and demos by local small business owners. Crafters and artists will have unique gifts for every occasion. 11. The third annual Bull & Oyster Roast is happening at Crab Corner on April 13. All-you-can-eat Maryland-style pit beef, coleslaw, potato salad, hushpuppies, corn on the cob, Old Bay chips, chicken wings, Guinness beer and Wild Roots cocktails, and 2 dozen oysters. 12. Concerts at The Park on April 13 will feature YouTube sensations Conkarah and Rosie. There will be live reggae, drink specials and more. Free. 13. The Kenny Wayne Shepherd Band is performing at Henderson Pavilion on April 13 during the Henderson Bluesfest. The 5-time GRAMMY nominee is on the road to promote new album titled "The Traveler." Touring with the Beth Hart Band.